Paul Mellon Fund, Avalon Fund, and Gift of Jo Ann and Julian Ganz, Jr.
Alfred Thompson Bricher began his career as a painter of autumnal landscapes, but by the late 1860s he had become a specialist in seascapes. His favorite subjects were the beaches and headlands of the New England coast, and he excelled at depicting such scenes in calm weather and lit by serene, luminous skies. At his best, as in the radiant A Quiet Day near Manchester, he was capable of equaling the finest work of fellow marine painters John Frederick Kensett, Sanford Robinson Gifford, and Martin Johnson Heade. 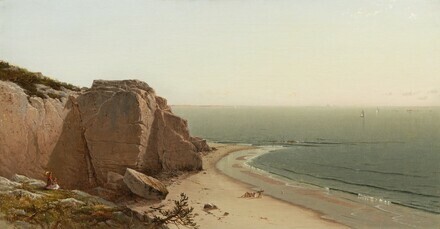 A Quiet Day near Manchester, 1873, depicts a scene on the Massachusetts coast north of Boston and seems to have been particularly inspired by Kensett, who had died unexpectedly the year before. The mass of meticulously delineated rocks at the left side of the composition and the expansive sweep of sea and sky bring to mind works such as Kensett's late Beach near Beverly, also in the Gallery's collection. Although Bricher painted many pictures over the course of his long career (he continued working until his death in 1908), the superb A Quiet Day near Manchester is unsurpassed. (Gerold Wunderlich & Co., New York), in 1983; Dr. Robert Aaronson, Branford, Connecticut; purchased 1989 through (Hirschl & Adler Galleries, Inc., New York) by Jo Ann and Julian Ganz, Jr., Los Angeles; acquired 2008 by gift and purchase by NGA. An American View: 1792-1961, Wunderlich and Company, Inc., New York, 1983, unnumbered catalogue, repro. Loan to display with permanent collection, National Gallery of Art, Washington, D.C., 1989-1990. Anderson, Nancy. "Alfred Thompson Bricher, A Quiet Day near Manchester." National Gallery of Art no. 40 (Spring 2009): 18-19, repro.